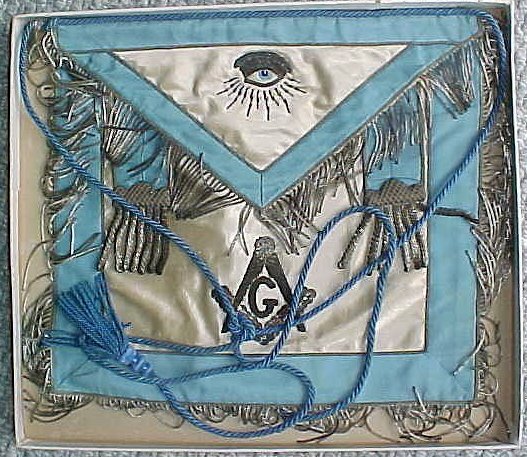 The 6 Lost Aprons – The Grand Lodge of Connecticut A.F. & A.M. I thought this was rather significant considering the recent announcement of the closing of the Ringling Brothers Circus. I didn’t write this. This was sent to me, I thought it was interesting, and thought I’d share it. The following article was adapted from a piece which appeared in the Baraboo News-Republic titled, “Yesteryear Revisited.” The text and accompanying photographs were prepared and submitted by Brother Steve Emerson, a Baraboo Lodge Past Master. The night of January 21, 1891 in Baraboo , Wisconsin was a special night for many of the men of Baraboo, and it has a direct connection to a special happening, some 111 years later. The story includes six soon-to-be-famous brothers and involves the ceremonial regalia they wore on that special evening. As is well known, there were seven Ringling boys, and young Henry had only recently become old enough for Masonic membership. 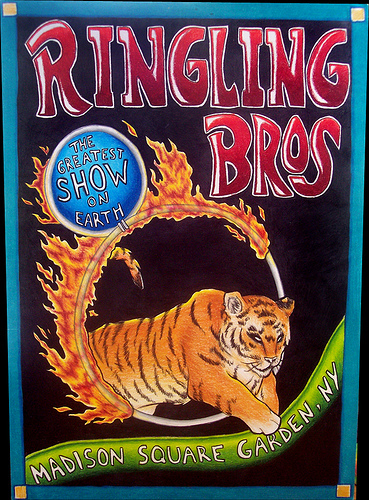 It was most unusual for as many as six of the Ringling Brothers to be in town at the same time. It was especially unusual on this evening that the six brothers occupied many of the major chairs in the Lodge. 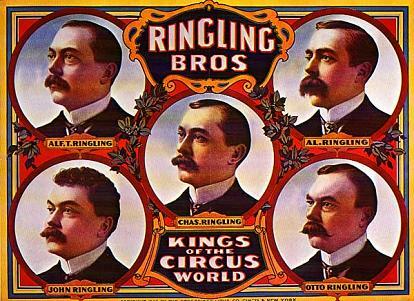 All seven Ringling brothers, including John , were members of Baraboo Lodge, before the year was out, Father August Ringling would join his sons in the Masonic Order. Central to the blue border was white lambskin, with the symbols of the office or chair being occupied embroidered thereupon. There is some speculation that the aprons were designed and produced by the Ringling Brother’s Circus wardrobe department in Baraboo. Religiously speaking, the Ringlings were members of St. John ‘s Lutheran Church , but nearly every church in Baraboo was represented among the other brothers present that night. It is known that Mrs. Ida (Henry) Ringling, not to be confused with Ida (Ringling) North, gave the aprons nearly 50 years ago to one Richard (Joe) Bennett, boyhood chum of Ida’s grandson, Henry Ringling III. Henry III died in an auto accident near Baraboo in 1961, and Bennett had become a friend and frequent visitor to Ida, Henry’s grandmother. Among the gifts she gave to Joe were the aprons. It is presumed that they had been in the possession of Ida’s husband, Henry Sr., and later with his wife Ida, since 1891. 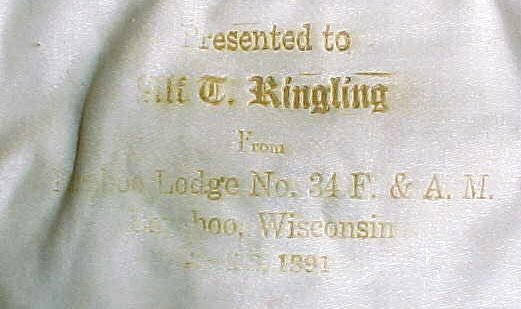 So, as we take up the story of that special night in Baraboo Lodge in January 1891, the Ringling Brothers occupied the chairs, the aprons were presented, and the Lodge prepared to build its own building. It is known that a committee was appointed and a fine building was built, on the NW corner of Oak and Second Avenue . It was this building, approved at the 1891 meeting, with the Temple rooms upstairs and McGann’s Furniture on the ground floor, which would burn some 65 years later. This fire in 1957 destroyed nearly all of the Lodge records, regalia and artifacts. The city of Baraboo has a heritage of two communities: the circus and the Masonic community. On the surface they may appear completely different-the Circus being an entertainment form for “children of all ages,” and the Masonic Lodge being a fraternal organization created to help men better themselves and their community. 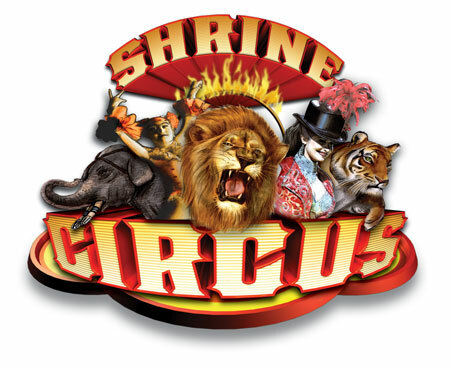 Throughout the years, there have been many Masons with circus backgrounds, including members of the Gollmar family (circus owners), the Moeller family (circus wagon manufacturers), General Tom Thumb, Harry Houdini, Buffalo Bill Cody, and Baraboo’s own Jimmy Williams (a.k.a. Happy the Clown), Tony Vinicki (Smaha), Robert Hocum (great-grandson of the charter Junior Warden).